Sudan’s Defence Minister, Lt Gen Ahmed Awad Ibn Auf, who was sworn-in as interim president of Sudan and head of the military transitional council, announced that he had steppped down after little more than a day in office. The Sudanese Professionals Association (SPA), which spearheaded the months-long demonstrations that triggered al-Bashir's overthrow, praised Ibn Auf's departure as a "triumph of the will of the masses". The group also calls on people to continue a sit-in outside the army headquarters in the capital and take to the streets outside the military's "various garrisons" elsewhere throughout the country. His successor, Lt Gen Abdelfattah Burhan, Inspector-General of the Armed Forces, was sworn-in as new interim president on the evening of Friday 12 April 2019. The head of Sudan's rapid support forces, General Mohamed Hamdan Dagalo, also known as Hemeti, was appointed deputy of the transitional military council. The retiring President of the Council also announced the exemption of Kamal Abdel-Maarouf from his post as Vice-President of the Council, without mentioning a replacement. A number of figures of the ruling National Congress party were arrested by a Sudanese army force and taken from their homes to an unknown location. The head of Sudan's National Intelligence and Security Service, Salih Ghosh, resigned from his post, the country's new military rulers said. "The chief of the transitional military council, Abdel Fattah al-Burhan, has accepted the resignation of... the chief of NISS," the transitional military council said. Ghosh had overseen a sweeping crackdown led by NISS agents against protesters taking part in four months of mass demonstations that led up to the toppling of veteran president Omar al-Bashir by the army. The party of ousted leader al-Bashircondemned the coup as unconstitutional and urged the military leaders to release its acting president and other key members. "We consider the military council's power grab a violation of constitutional law," the National Congress Party said in a statement. "The NCP rejects the detention of its leaders, among them its acting president and a large number of prominent members, and calls for their immediate release." The decision to appoint Burhan was welcomed among the demonstrators. He was one of the senior officers who contributed to the protection of the protesters in the vicinity of the General Command of the Sudanese armed forces. On several occasions, he went to the sit-in area, spoke directly with the protesters, and made contact with activists in the revolutionary movement. On Friday morning, prior to the announcement by Ibn Auf that he would step down, Burhan was seen speaking to one of the leaders of the opposition Sudanese Congress Party, Ibrahim El Sheikh, at the sit-in in front of the General Command of the Sudanese Armed Forces. The name of Abdul Fattah al-Burhan became a shining name in the world of politics and media after Awad bin Auf stepped down from office two days after Sudan's coup. 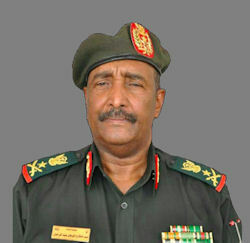 Lt Gen Abdelfattah Burhan, as Inspector-General of the Armed Forces, was not as close to Al Bashir, and the Military Transitional Council hoped that Burhan will be more acceptable to the people, who are adamant that the interim government should include civilians, and not replace one military junta for another. Burhan is said not to be affiliated with any political body or organization. Sources with close ties to the new head claim he is the only one among Sudan’s senior military figures without a case at the International Criminal Court. This was the second time that the name of Abdelfattah al-Barhan had appeared publicly in less than two months. His name was mentioned in the presidential decisions issued by President Omar al-Bashir, on 26 February 2019, as part of a general shakeup of the military command. It included appointments and amendments to the chief of staff and the Sudanese army. At that time, al-Bashir upgraded Abdul-Fattah al-Burhan from the rank of Lieutenant-General to the rank of full General, and appointed him Inspector General of the Armed Forces. Sudan had been the scene of large demonstrations since 19 December 2018, which killed dozens of dead and left thousands wounded. The most prominent event on Thursday 11 April 2019 was the announcement of the removal of President Omar al-Bashir and the formation of a Transitional Council to run the country for two years. His name recently jumped to the forefront of events in Sudan, before he held the highest political and security post in a rapidly changing country under pressure from months of popular protests. Little is known about the Sudanese military commander. Abdul Fattah al-Burhan was one of the advocates of ousting President Omar al-Bashir, and supervised the arrest after the army's decision to isolate him, thus taking over the responsibility of managing a sensitive phase in the history of the county. Lieutenant General Abdel Fattah Burhan, 60, served in Sudan’s border guard and was later appointed to China as a military attaché. He worked as a trainer at a military college in eastern Sudan, and served as a commander in wars in the country’s south before South Sudan gained independence from Sudan in 2011. He later became commander of the border guard, eventually advancing in his career as a commander of the Land Forces. Burhan reportedly made frequent visits to the United Arab Emirates while he was a coordinator for Sudan’s military forces in Yemen. Al-Burhan supervised the Sudanese forces in Yemen in coordination with Mohamed Hamdan Daklou, commander of Sudan's rapid support forces. Burhan was born in the village of Kandto in the state of the River Nile, Sudan, in 1960, which is about 172 kilometers from Khartoum, it is close to the historic city of Shendi. He came from a religious family that owed allegiance to the Khatami way, one of the Sufi methods in Sudan, and is the religious arm of the Democratic Unionist Party led by Mohammed Osman al-Mirghani. Abd al-Fattah al-Burhan, the third son among seven boys and two daughters, was born to Abdul Rahman al-Burhan and his wife Safia al-Siddiq, whose roots are attributed to Sheikh Ali al-Hafian. As is the case of many tombs in Sudan. Abdul Rahman al-Burhan also built a dome on his grave after his burial in the city of Eidj in the east of the island of central Sudan. He studied elementary and middle school in the schools of his village, the majority of whose population is the Chaikya tribe, one of the most famous Sudanese tribes. He then moved to Shendi where he completed secondary school before joining the Sudanese military academy. After graduating from the War College, he worked in Khartoum and traveled between the units of the Sudanese army. He also participated in combat fronts in southern Sudan, Darfur and other areas and has been assigned training courses in Egypt and Jordan. The brother of the head of the new military council, Abdul Qader Burhan, was quoted as saying that his brother had known courage, honesty and integrity since his youth. The family was deeply concerned after their son was declared president of the transitional military council. Is due to the great stalemate the country has had over the past months. Abdul-Qader al-Burhan confirmed that his brother did not belong to any political party throughout his life and did not have any ideological orientation. "One day, when they were sitting with children, they remembered their father, Burhan Abdel Rahman, who then went to talk to their brother Abdel Fattah to tell him that he would become a great leader, and that would be the test of proof or exile at a difficult stage in the history of the country." A 10-member delegation representing groups behind the months-long anti-government demonstrations held talks with Sudan's military council at the army headquarters in Khartoum on 13 April 2019. The meeting came as the new head of the council calls for dialogue and vows that a transitional period will last a maximum of two years. The new head of the military council said those involved in the killing of protesters will face justice and ordered the release of protesters jailed by special emergency courts. "I announce the restructuring of state institutions according to the law and pledge to fight corruption and uproot the regime and its symbols," al-Burhan adds in a televised address to the nation. In his televised address to the nation, al-Burhan says: "I invite all the people of Sudan, including political parties and civil society groups, to engage in dialogue." The council's new head adds: "A military council will be formed to represent the state until an interim government is formed. The interim military council commits to the following: A two-year transitional period during which, or at the end of which, power will be handed over to a civilian government formed by the people." The new leader of Sudan's military transitional council has announced the lifting of the curfew. Addressing the protesters, al-Burhan says: "In order to provide an atmosphere for your design to establish a state, we declare that the curfew is lifted, all detained or sentenced under martial law will be immediately released."